What Are the Best Reading Pillows to Read In Bed? Home » PIllows » What Are the Best Pillows for Reading in Bed? What Are the Best Pillows for Reading in Bed? If you’re an avid reader, you might enjoy reading a good book in bed. The problem is that finding a comfortable position to read and sit in bed can be a little difficult. Fortunately, there are certain pillows that will help keep you comfortable while you read your book in bed. Here we’ll review the best pillows for reading in bed. What Are The Benefits Of A Reading Pillow? You might be wondering why you need to get a special pillow just for reading. Can’t you just use the pillows that you already have? You could, but a reading pillow will help give you a more supportive and comfortable position for reading while you’re in bed. Reading pillows will tend to be a little firmer than the pillows you sleep on. This keeps your whole back more supported while you are sitting in bed. If you just use your regular pillows to prop you up, over time they will squish back and lose support. A reading pillow will keep its shape and won’t compress as much as your other pillows might. While a super firm pillow might not be good for sleeping, it is good for reading in bed. There are a few reading pillows that are made to help keep your arms supported while you read. After awhile your arms can get tired while holding up a book. A pillow with armrests is going to help keep your arms comfortable and cut down on the tension in the neck and shoulders. Are There Different Designs Of Reading Pillows? There are a few different designs when it comes to reading pillows. They will all help you feel more comfortable while you sit and read in bed. You’ll have to decide which kind works best for you and your needs. These reading pillows are in the shape of a large wedge and are used to prop up your whole upper back while you read. 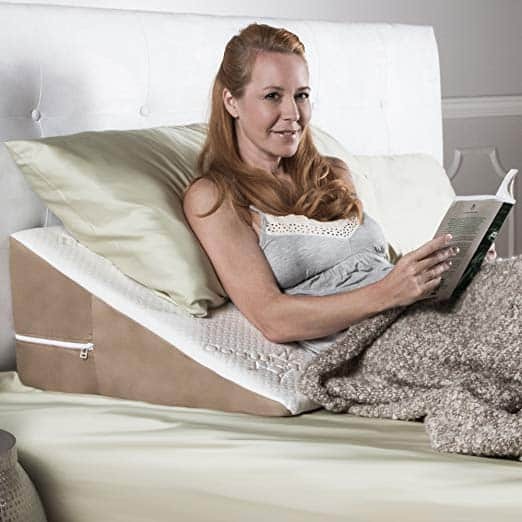 A nice feature of a wedge reading pillow is that it completely elevates your entire upper body. The lower part of the wedge goes right at the top of your hips and the pillow gradually inclines to put you in the best position to sit and read. You can also use your own pillows on top of a wedge pillow for even more added comfort. A wedge pillow is also good for other situation where you need to elevate your head, neck, and shoulders like heartburn or a head cold. These pillows have a back pillow that comes with two arm supports. These are one of the most popular options for reading pillows because they not only keep your back comfortable but help prop up your arms as you read. Usually, these pillows are made filled with cotton, microfiber, or some other type of synthetic filler. This allows the pillow to be very firm and keep you supported while you are sitting. You can find a few back pillows with arm supports that are made out of foam, either memory or latex, but these can be more expensive. The other nice feature of these pillows is that you can find them in a variety of colors and fabrics which makes it easy to fit in with the decor of your room. This kind of reading pillow isn’t as popular as the other two options, but you can still find it if you look. This pillow has a wider base and a narrower top. The wide wedge-like bottom helps support your lower back and the narrow top allows your shoulder to relax back. These pillows are usually filled with a poly-blend fill. This makes it soft and able to be molded to fit your body and give you the most comfort. Do I Need To Be Concerned About The Material Of My Reading Pillow? There are two main materials when it comes to a reading pillow and each one has their own advantages and disadvantages. This is the more popular type of material for a traditional reading pillow. Because you aren’t sleeping on a reading pillow, it doesn’t necessarily have to be made of specialty materials. A cotton or poly blend is going to provide a very firm surface because these pillows will usually be overstuffed. This makes sure that it can keep its shape when you lean against it. The only downside to this kind of material is that it is going to break down over time. You might notice that the filling starts to sag or go flat and you might need to replace the pillow to keep your back protected. 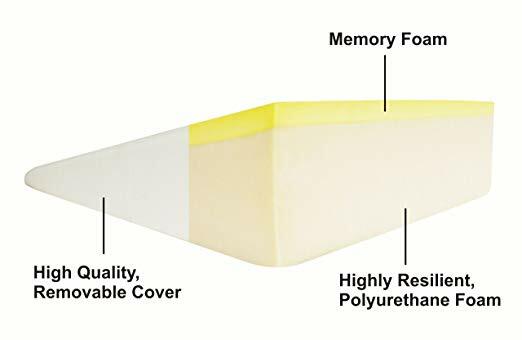 You can usually find memory foam in the wedge reading pillows, but there are a few options that include back and arm rests. The memory foam pillows are nice because their design will conform to your body and kind of cradle your curves as you sit. These reading pillows will also not break down over time so they will last longer than a cotton or poly blend pillow. This also makes them a little more expensive, but the quality can be worth the cost. How Affordable Is A Reading Pillow? You might not be ready to shell out a lot of money for a pillow that only has one purpose. Luckily, you can find a reading pillow that fits your budgets and offers you all the benefits of reading in bed comfortably. A reading pillow can cost anywhere from $30 to $60. If you don’t want to spend a lot of money you can find some that will be less than $30, but be cautious because they might not be good quality and you will have to replace it sooner. Shelling out a little more money for a good reading pillow can end up saving you money in the long run because your pillow will be more durable. This reading pillow is a good example of the triangle wedge pillow. It is made of 100% Foam so it firm and allows for proper position for reading in bed. 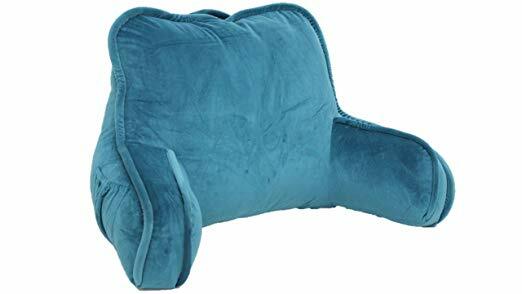 This pillow somes in multiple sizes depending on your height and preferred reading position. 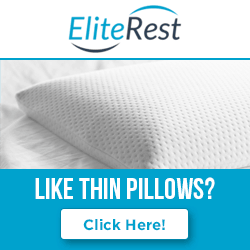 Not only is this a great pillow for reading but it also improves issues with acid reflux, snoring, allergies, or other condition which breathing may be impaired in supine position. 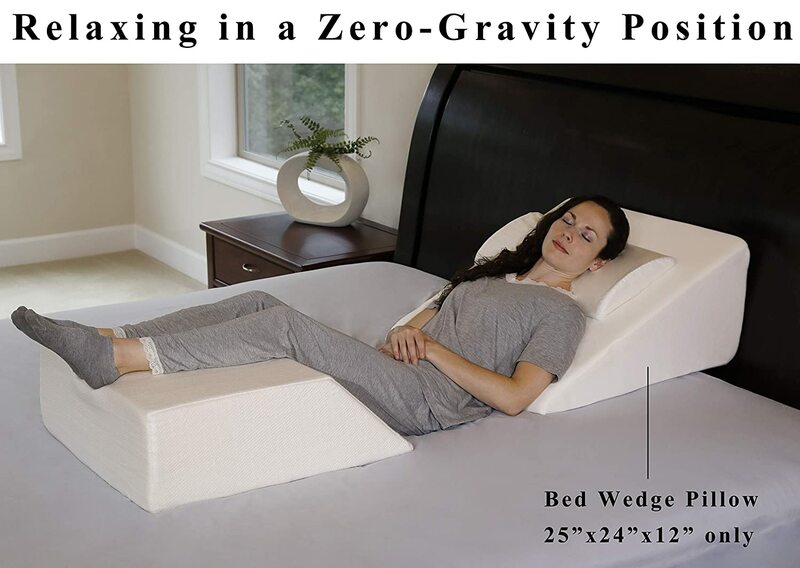 You can position it with the wider end on the bottom to prop you up while you read or watch TV and then reverse it so the wider end is at the top to elevate your head while you sleep. Click here to read more about this pillow. This is one of the more traditional reading pillows that you can find. It features a wide back pillow with two arm supports coming off the sides. It is generously filled with 100% polyester fiber that is made in the US. It is covered in a plush fabric that is easy to wash and clean. This pillow comes with a handle on top so that it is easy to move on and off the bed as well as to different rooms. It also has a pocket on the side of the arm so you can store books, magazines, and remote controls. You can use this pillow on top of your bed, but it also works well on the floor and other surfaces where you need extra back support. This is another bed rest reading pillow that features a large back and two arm rests. It is filled with 100% polyester fiber and also has a handle for easy transportation. There is also a small pocket on the side of the arm. This pillow is covered in a microsuede cover that comes in different colors so you can find one that matches your decor. Because it is made of suede, this pillow can be a little difficult to clean and might stain. It is also smaller than other reading pillows so it might work better in smaller spaces like a twin bed or in a dorm room. This wedge pillow is made with two layers of memory foam to keep you comfortable and supported while you read. The base layer is made of highly resilient polyurethane foam and then covered with a thin layer of high-density memory foam. The whole wedge comes with a machine washable cover. The nice thing about this wedge bed pillow is that it is extra large so it provides a wide surface to read and relax on. It can also be used for other sleeping issues like acid reflux and it can be placed under your knees and legs as a lower body support while you sleep. The Avan Back Wedge is made of high-density memory foam that comes with a 100% bamboo fiber cover that can be removed for easy washing. It is 24-inches long so if you have a long torso this will be a good fit for you. You can get this back wedge in two different sizes. The tall size has a 12-inch rise and the short size has an 8-inch rise. This is a nice feature so you can find the right height for your body. This pillow will arrive compressed and compact but will expand to its regular size after it is opened. Click here to read more reviews​.